12 Tribes Rootz Wear is a new clothing line coming out soon from St.Lucia. It's a clothing line for conscious people ... that's as much info, I've gotten thus far. St.Lucian artiste, Zionomi is in every ad campaign for the tees. 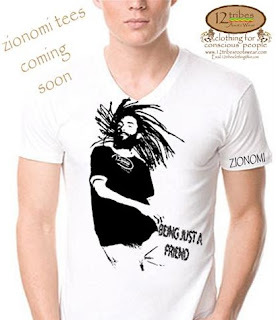 Also expect a 12 Tribes - Zionomi t-shirt, inscribed "Being Just a Friend," which is Zionomi's 2008 hit on the Sunrise Riddim. In 2009, Zionomi returned with Bobby Bling, asking "Who R U?"